Five and Thirty Years -- Let's have it ! On this very blog, five years ago, I wrote an article Manhattan 25 Years Ago. Today, it’s now thirty years on since John Lennon was assassinated in New York. On French radio this morning on my way to work the station dedicated the day to Lennon. Aside from a few errors by some of the guests (mentioning that during Abbey Road sessions, the band played a concert on the roof when in fact it was for the Let It Be sessions) most of the guests seemed particularly knowledgeable and even mentioned that Strawberry Fields in Central Park post dates the song, which was inspired by a Salvation Army orphanage in Woolton, Liverpool – actually called Strawberry Field. On of my first memories that can be accurately dated is hearing the announcement of the death of Lennon. My son Nathan is now about the same age as I was then. He’s now five; thirty years ago I was five. This entry was posted on Wednesday, December 8th, 2010 at 9:56 am and is filed under music & film, nostalgia. You can follow any responses to this entry through the RSS 2.0 feed. You can leave a response, or trackback from your own site. 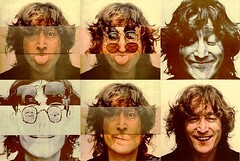 Lennon hated all the “reverence of dead heroes” but himself has become the object of just such success. In any case, his influence has yet to be surpassed – indeed, his untimely death has put him above McCartney who is just as worthy (in my opinion) of the legacy of The Beatles. Peace protests and the post-Beatles era belongs more to John though. He was always more political too (ever since “more popular than Jesus”…).